This is the only one I would consider skipping if I was marathoning the Christmas episodes. 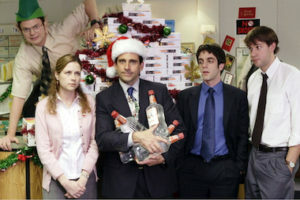 Between Michael and the staff futilely attempt to address Meredith’s alcoholism, Phyllis blackmailing Angela about cheating on Andy with Dwight, and Toby being especially pathetic as he tries to get the hottest toy for his daughter, Moroccan Christmas just doesn’t have enough Christmas cheer to make up for all the bummer story-lines. 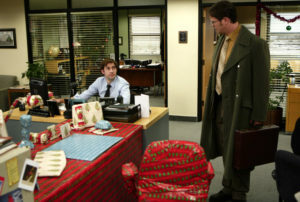 On the plus side, the cold opener with Jim’s “wrapping” Dwight desk is a classic, and Dwight buying up all the Princess Unicorn dolls and selling them to parents at high mark-up provides some amusing moments as well. JAM Factor – 2 teapots This is the first Christmas episode with Jim and Pam together and they have a couple okay scenes but they never come through with any particularly sweet and touching moment like they have previously, and an opportunity to lighten the cynical mood of this episode is sadly missed. This episode had a lot of hurdles to clear: it was in the middle of the lacklucker Season 8, it was the first Christmas without Michael Scott, and Pam was also not present due to Jenna Fischer being gone on maternity leave. 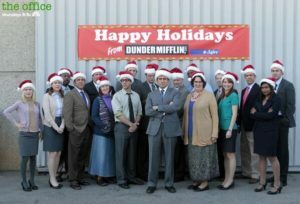 Despite all that, this is a solid Christmas episode with plenty of laughs, plenty of awkwardness, and even a couple poignant moments, qualities all great Office episodes have. When Andy threatens their Christmas bonuses if they are caught pulling a prank on each other, both Jim and Dwight entertainingly try to set either other up. Erin attempts to drink her jealousy of Andy’s girlfriend away, and is rescued by Robert California of all people, who is being less of a creep and more of a caring, concerned boss than usual. Pretty much everyone gets a sweet or funny scene, Darryl making foreman Val feel less overdressed, Kelly showing she can be a mean girl with the best of them, Oscar displaying his “Cocktails” skills, and the office guys having a rad air-guitar session to Mannheim Steamroller. JAM Factor – 1 teapot Like I said, Pam is off on maternity leave so not really any opportunities for any JAM, Dwight “pranks” Jim by using Jim’s card to pay for a $200 bouquet, and that’s pretty much the only time Pam is mentioned. Though Season 6 is sadly marked with an increase of mediocre episodes, “Secret Santa” manages to bring the awkward holiday cheer as well as advance the season’s story arc. Phyllis is overjoyed that Jim has given her the nod to be Santa, but of course Michael can’t handle not being the center of attention, first having a dueling Santa battle with Phyllis then getting borderline inappropriate when he dresses as Jesus. This leads to Michael finding out from CFO David Wallace that Dunder Mifflin is about to be sold and the new buyers are looking to “clean house”, a secret that of course Michael tell everyone about five minutes later. Meanwhile Pam is on a mission to set up Oscar with a hunky warehouse guy, and Andy is not sure what to do when his efforts to impress Erin by getting her a real life “12 days of Christmas” fall short (not his fault the first 7 days are pretty much birds!). Thankfully everything more or less works out when the CFO reveals that the Scranton Branch will not be closing, and the office is treated to Andy’s final gift to Erin: 12 drummers drumming in the snowy parking lot. JAM Factor – 1.5 teapots Like “Moroccan Christmas”, I watch this episode eagerly awaiting a sweet JAM moment, especially with them recently married and with Pam pregnant, but the moment never arrives in the aired episode. In fact, most of this 1.5 teapot rating comes from a quick for-some-deleted scene where Pam catches Jim under the mistletoe. 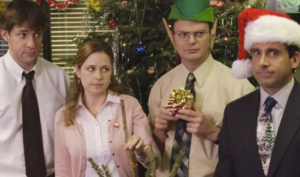 But, unlike Moroccan Christmas, both Jim and Pam get their own storylines in this episode mostly independent of each other, so the lack of a decent JAM moment isn’t quite so obvious. The Office was shaky it’s last couple seasons but it’s final Christmas episode was pretty dang good. It’s the day of the Christmas party but a certain head of the party planning committee fails to plan anything (let’s just say it’s been a rough time for Angela). 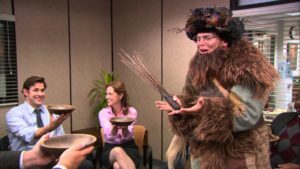 Thankfully Dwight is ready to throw a Traditional Pennsylvania Dutch Christmas completely with gluhwine, hog maw and the gift-bringer Belsnickel (all real Pennsylvania Dutch things). 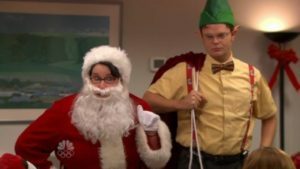 Dwight dresses as Santa Clauses dirtier, grouchier cousin Belsnickel, who determines if everyone has been impish or admirable and gives great gifts like rubber gaskets and mouse traps. Meanwhile, Darryl is getting angry drunk as Jim hasn’t really been included him in Jim’s Philly start-up plans, and Pete has an opportunity to get closer to the lonely Erin watching the classic romantic Holiday movie: Die Hard. Overall, even Belsnickel himself would dub this episode admirable. JAM Factor – 4 teapots In addition to coming through with a good final Christmas episode, the Office also really comes through with the Christmas JAM. 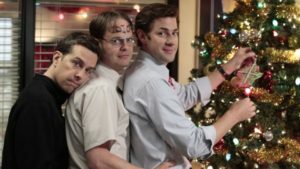 With Jim starting a new part time job in Philadelphia, Pam wants to make sure this years Christmas party is extra special for him and helps set up the ridiculous yet endlessly entertaining Schrute Christmas. But when Jim leaves early so he can stay the night in Philly and be rested for his job, Pam can’t quite hide her sadness (nor can Dwight). Thankfully Jim decides time with his wife is far more important, and returns to the party. Though there’s definitely foreshadowing of how difficult the Philly job is going to be for Jim and Pam, for now they’re together, they’re happy and all is good in Jam land. This is Michael Scott’s final Christmas episode and it’s more than worthy of the title with great ensemble acting and a few interesting twists. It’s the Holiday season time and for once it looks like the Christmas party is going to be easy and drama free. But then news breaks that Toby is leaving for jury duty on a high-profile case and Holly Flax will be filling in, causing Michael to insist that every regular Christmas party plan be scrapped and replaced with “classy” Christmas, complete with Michael as a Hugh Hefner-esque Santa Claus. Unfortunately Michael’s plan to impress and woo Holly hits a snag as Holly is in a pretty serious relationship with someone else, resulting in him acting rather immature and jealous. Meanwhile Jim is living in fear with Dwight seeking retaliation for a snowball throw, Darryl is struggling to keep the party entertaining for his daughter, and Oscar suspects Angela’s (state) senator boyfriend has a secret. Towards the end of the episode, Michael gets a little pep talk from Pam, who certainly knows what it’s like to be in a serious relationship and struggling with feelings for someone else, and Michael seems to decide to take a new approach with Holly: be himself and see if she will come back to him. JAM Factor – 3 teapots Even thought they were together in the S5 and S6, the Christmas episodes of those seasons just didn’t have the subtle JAM sweetness of older Christmas episodes, but finally “Classy Christmas” delivers! Pam sets out to make a special and unique Christmas gift and creates a comic book starring Jimmy Halpert. Then she makes the mistake of asking others for their input and the mixed reaction leaves her doubting if this was actually a good enough gift, compounded by Jim giving her jewelry. Of course, the only reaction to her comic book that counts is Jim’s, and he’s blown away by Pam’s thoughtful gift. In a talking head Jim can’t quite put it into words how he feels about Pam’s gift yet you can tell by his face it’s nothing but love. After getting dumped, Michael is in a funk and lashing out at everyone, so to cheer him up Andy, Dwight and Jim take him to Asian Hooters, aka Benihana’s. At the office, rival Christmas Parties break out as Karen and Pam form an unlikely team (much to Jim’s dismay) to take on Angela, forcing employees to choose between Angela’s tradition “Nutcracker Christmas” party in the conference room and Pam and Karen’s impromptu “Margarita Christmas” in the breakroom. Michael attempts to get back in the dating game by inviting a Benihana waitress back to the office, and let’s just say it doesn’t go well. Karen and Pam’s party is a success, but in the name of Christmas, they decide to make peace with Angela, merging the parties into one big office-wide party everyone is welcome to. In the end this episode does show us in a non-cheesy way how easy it is to rise above office politics and rivalries and work together to have an enjoyable time as well as to be there for each other. JAM Factor – 3 teapots : Definitely a stealth JAM episode where there is not a lot of interaction between the two but the emotion and tension is still palpable. Pam organizes the perfect “gift” for Jim in the form of a great setup for a prank on Dwight, but Jim, who at this point is newly dating Karen and is trying to avoid falling into his old habits of pranking (and of being in love with Pam) turns Pam’s gift down. For much of the episode Jim and Pam aren’t even in the same building but with about 5 minutes left, we get Jim subtly admitting his relationship with Karen is a rebound and his heart is still very much with Pam. The episode finished off with Jim letting down his guard and accepting Pam’s gift (resulting in a great final scene with Dwight). They would have another half-season of hurdles to clear after this but for just a moment the amazing JAM teamwork (and chemistry) is on display and everything feels right. For Secret Santa, Michael go just a bit above-and-beyond and gets Ryan a $400 video iPod (no smartphones at this time, folks!). When his effort is rewarded with a homemade oven mitt, Michael decides to spice up the gift exchange with Yankee Swap (known to some as White Elephant, or Nasty Christmas). Things only get worse when Michael admits he got a big bonus for firing someone and everyone’s pretty much done with Michael and with the party. But Michael then buys the one thing to save all this, 15 bottle of vodka, and the party turns out to be not so bad after all. 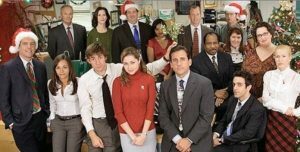 From the underwhelming tree lighting to the tension filled gift exchange to a couple employees having too much to drink, this episode makes you feel like you really are at a mediocre Office Christmas party. Which I mean in the best possible way as this episode strikes the the right balance of funny and cringe-worthy and sweet, making it not just a great holiday episode but a great episode of The Office overall. JAM Factor – 4 teapots Kind of obligated to give the episode that introduced us to the Teal Teapot of Love all the teapots, right? Jim finally gets Pam for Secret Santa and puts together a gift of a teapot filled mementos of their friendship, as well as a card which Jim all but admits during his talking head contains a declaration of his true feelings for her. Pam loves her teapot, but when Yankee Swap breaks out, she along with everyone else is gunning for the iPod. Jim tries to play it cool however it’s clear he’s upset by Pam trading up his gift, which ends up in the hands of Dwight. But Pam decides to pick friendship over the expensive electronic, and Jim and Pam share a sweet scene over the teapot when she checks out all the “bonus” gifts. One “bonus gift” she does not get is the card as Jim takes it back before she opens it. but then in season 9 the writers beautifully tie back to this episode as Jim finally gives Pam the card the moment she needed it most, which of course make this episode all the more special. Alright, there we have it, the Christmas Episodes ranked! Now it’s your turn to give us your opinion! Vote for your 2 favorite and least favorite episodes, and/or feel free to leave a comment with your preferred Christmas episode order!